Now Booking Spring 2019 Projects! Let's Chat. The #effortlesswebkits are the non-techy business owner’s dream – with everything you need to get a fabulous & high-converting website up with ease. The #uncomplicatedbrands pair perfectly with the website kits – a plug & play template for your branding. Simply add your business info and boom, you’ve got a professional brand to work with. When you set up your new website, getting a quick brand refresh (or a NEW brand) is a smart move. 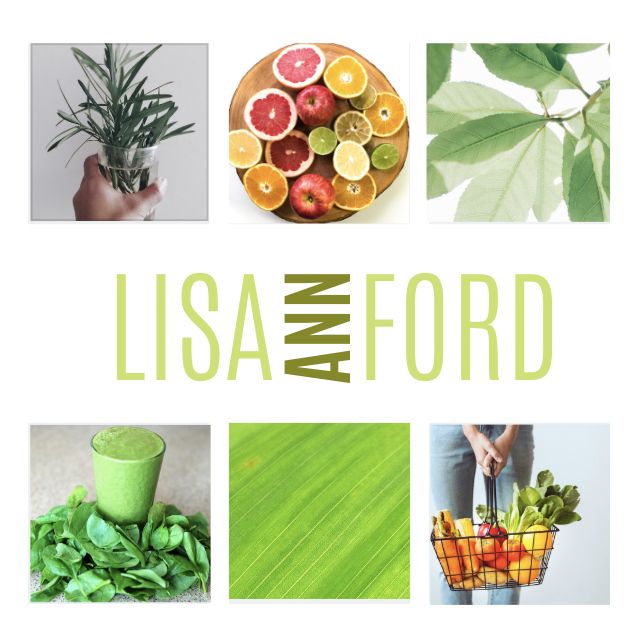 Every time I have personally updated my website, I did a little fun branding shake-up (logo, colors, etc). 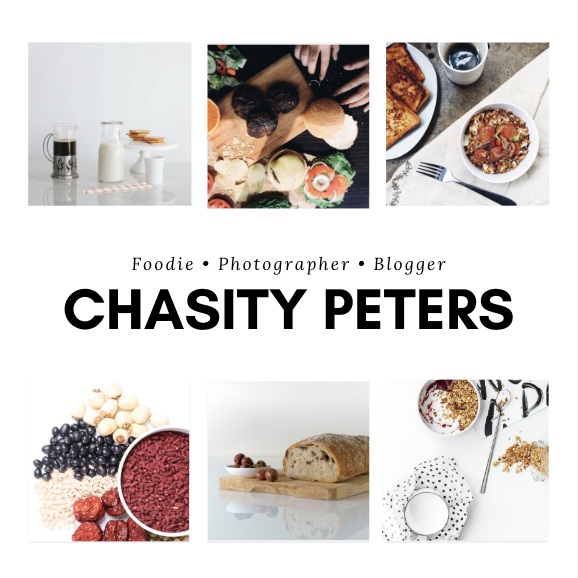 Not only does the new branding align better with my new website but it also makes launching SO much more fun. 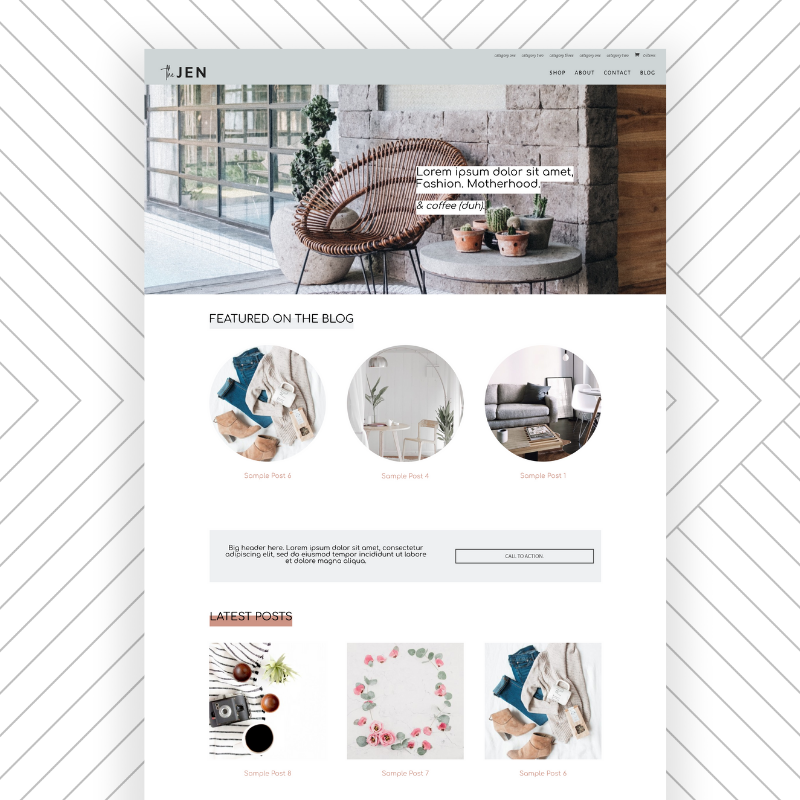 Working with an effortless website kit makes integrating your branding so easy with the Make it Yours! Customization interface. 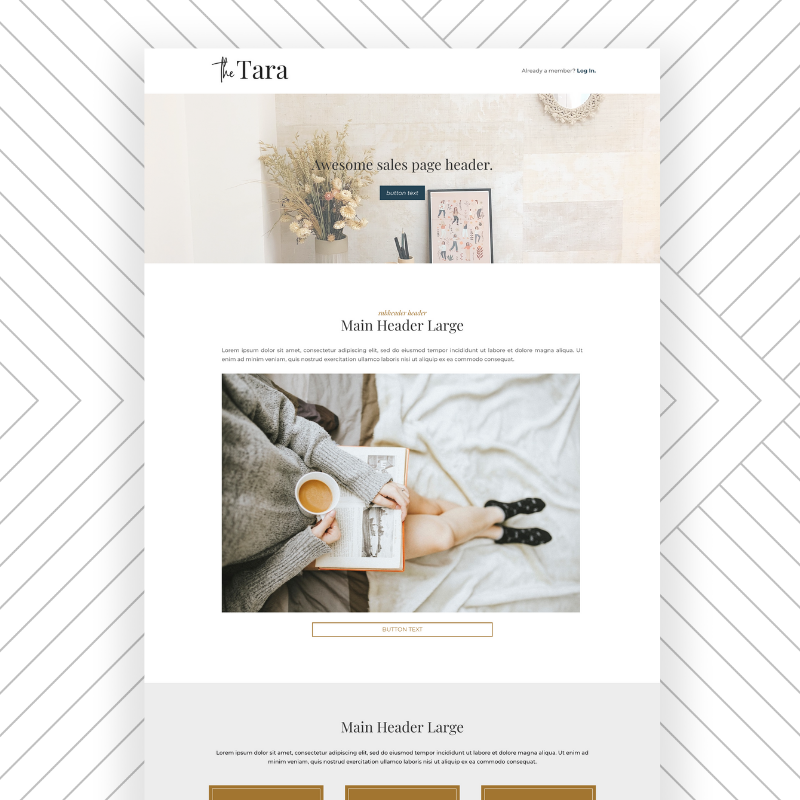 What if you could have a branding sheet that has your logo, colors & typography on hand, so you just plugin in the text codes, fonts and sizes and BOOM your website is branded?! The Uncomplicated Brands by The Higgins Creative do that exact thing for you. Update your business info on the template and then keep it nearby as you update your branding on your website! 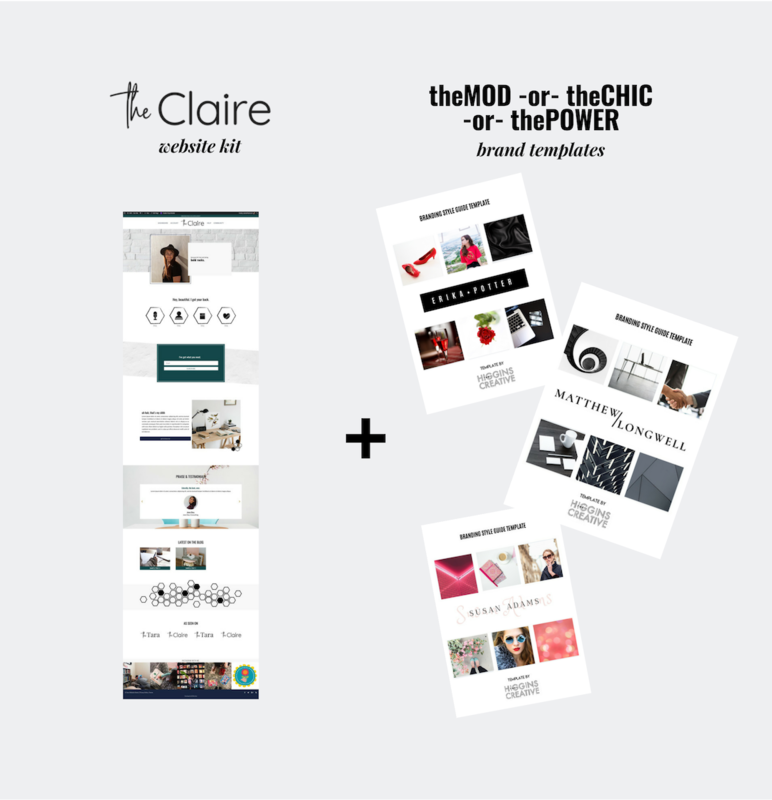 The Claire is a website kit for professional, bold & creative service providers. This website is built to convert no matter WHAT page your visitor lands on – filling your calendar & inbox with interested leads ready to hire you for your expertise. theMOD: Great for coaches, boutiques, or personal branding without all the frills. Keep it simple with black, gray, and white, or change it up by choosing a chartreuse or orange to grip your audience! theCHIC: Great for the brand that expresses femininity and class. Dazzle your audience with a warm palette or switch it up and use cool colors to reassure them and let them know you’ve got their back. thePOWER: Great for the brand that expresses femininity and class. 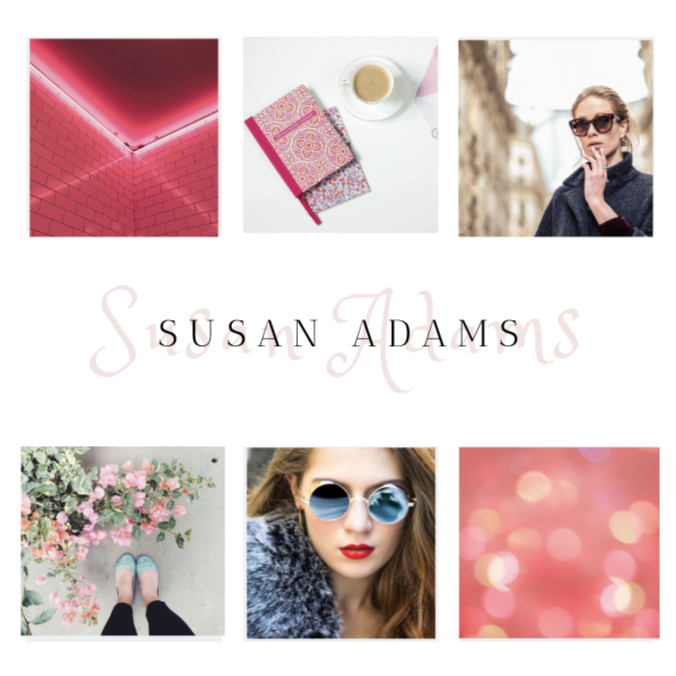 Dazzle your audience with a modern, simple palette or switch it up and add a few color pops to connect with them and stand out from your competition. 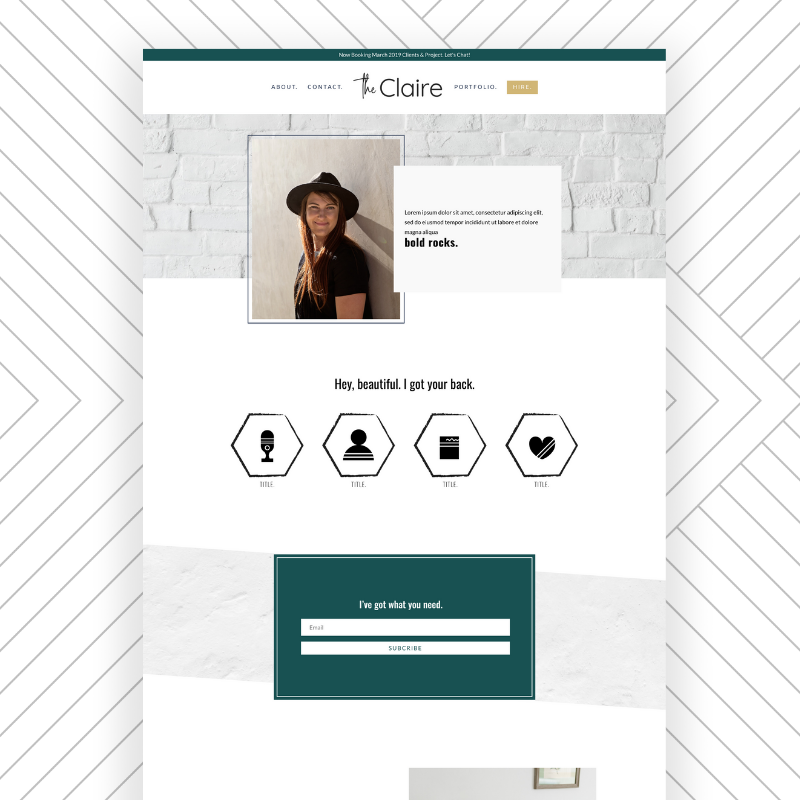 Get Started: The Claire + Your New Brand. 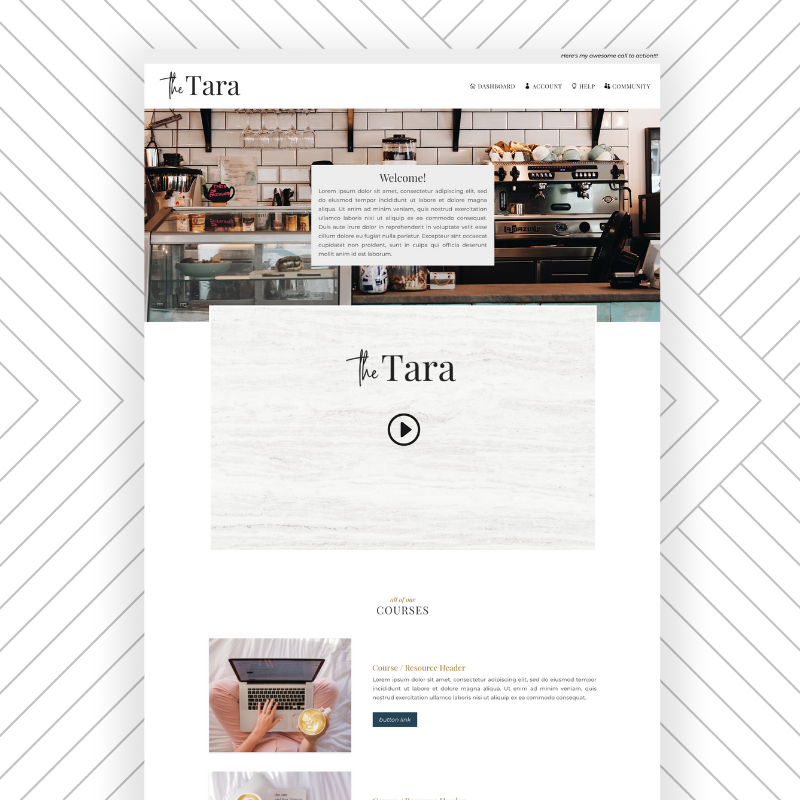 The Tara is perfect for the course creator, infopreneur or coach ready to protect their valuable content and provide a seamless, easy to use membership portal for their clients and customers. theWANDERER: Great for the brand that values connection and authenticity. 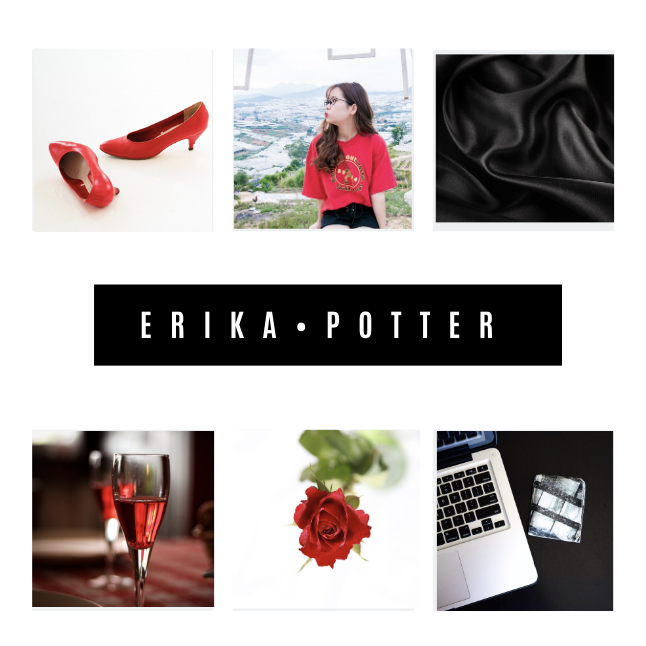 Attract your audience with a warm palette, calming visuals, and a smooth transition into lifestyle/influencer territory. theWELLNESS: Great for the brand that values a fresh perspective and happy feelings. 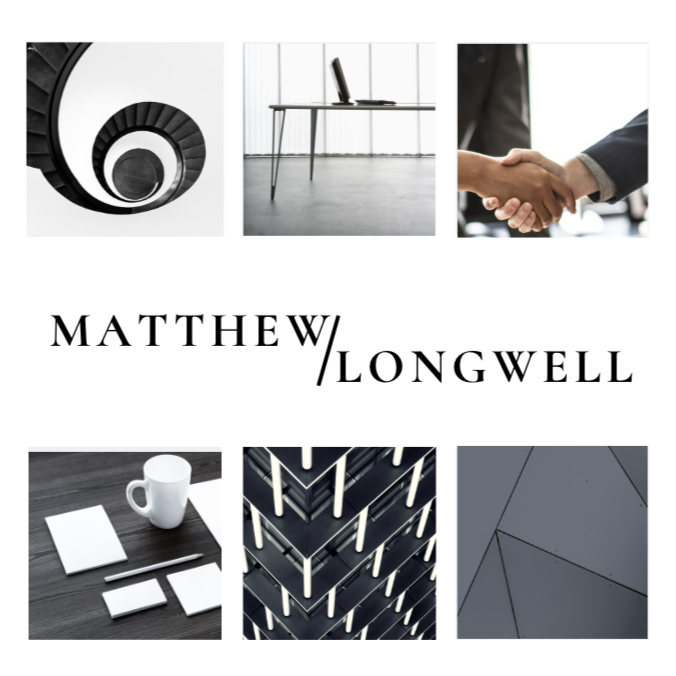 This brand style connects with your audience through joy-filled imagery and modern and approachable messaging. theFOODIE: Great for the food lovers, the choppers, and the people with fresh perspectives. 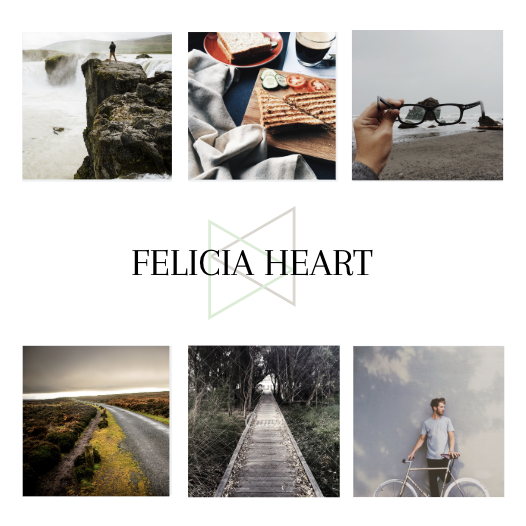 This brand gives your audience a new outlook on life and encourages them to use what’s around them to enjoy, savor, and love with their whole heart. 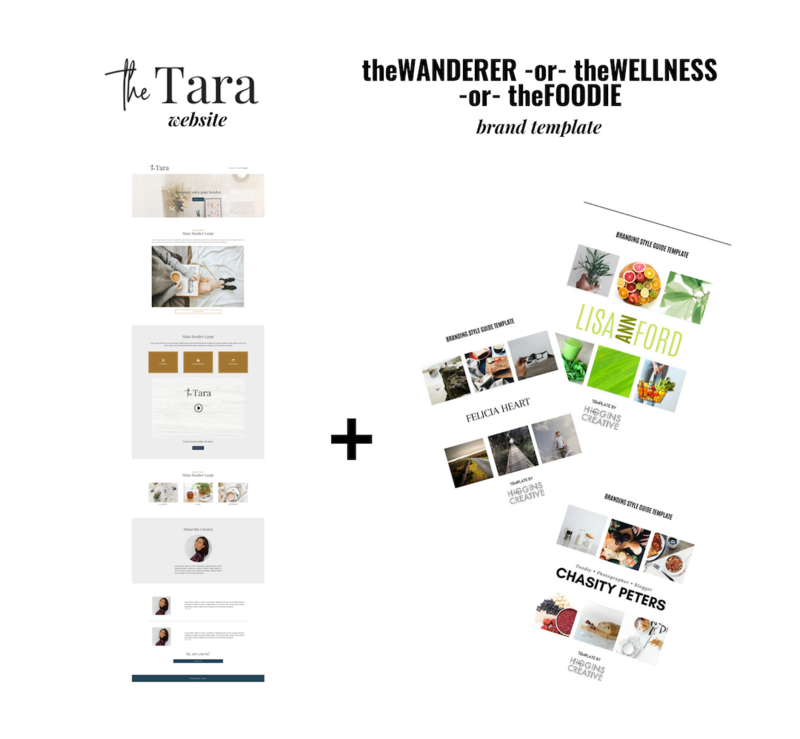 Get Started: The Tara + Your New Brand. We totally want to see how you take these kits & apply your own spin to them, add in your unique business and branding and TRULY make them yours!! Be sure to share on Instagram with the #effortlesswebkits & #uncomplicatedbrands hashtags and tag @hellosammunoz and @lilahhiggins for a possible feature. What if you could have an incredible website you loved AND got visitors to take action? What if it could be effortless? Community is kind of a big deal when it comes to learning tech & growing a business, wouldn't you agree? I love Instagram for connecting with potential clients, students & the tech community at large. Get techie with me on the 'gram. Divi is a registered trademark of Elegant Themes, Inc. This website is not affiliated with nor endorsed by Elegant Themes. All trademarks and name brands are the property of their respective owners.